Find out about upcoming events, news and resources relating to the Victorian Treaty process. Find out where the next events will be. Some of these are for the Victorian Aboriginal community and some are open to all. VTAC is a government body responsible for setting up a process of election for the Representative Aboriginal Body, negotiating the framework of treaty and taking guidance from the Victorian Aboriginal community. This campaign is run by the Greens and supports a Treaty which is heavily informed by Clan Elders. The Greens support the Treaty Bill 2018. FVTOP is an alliance of all Traditional Owner Groups around Victoria. 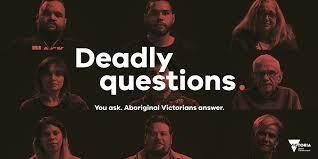 Deadly Questions is an online platform which allows all Victorians to ask Aboriginal Victorians questions to encourage an open dialogue. Written by the Victorian Traditional Owners Land Justice Group (VTOLJG) as an open letter to the Prime Minister, Opposition Leader, Referendum Council, Victorian Parliament and Clans of Victoria, this letter outlines the legitimacy of a clans based treaty and the importance of guidance by Clan Elders.